What do the fields under "SKU Mapping" mean? We recommend that your Amazon SKU match the QuickBooks Online Inventory Name to reduce any potential confusion. This is because both identifiers are unique, whereas the QuickBooks Online SKU field can be shared amongst numerous items. If you're using QuickBooks Simple Start or Essentials, you'll have to select "Use the following item for all (Marketplace) SKUs. Then type the name of the Non-inventory item that you've created in the field below. If you choose, we can also create new Inventory items in your QuickBooks Online account. 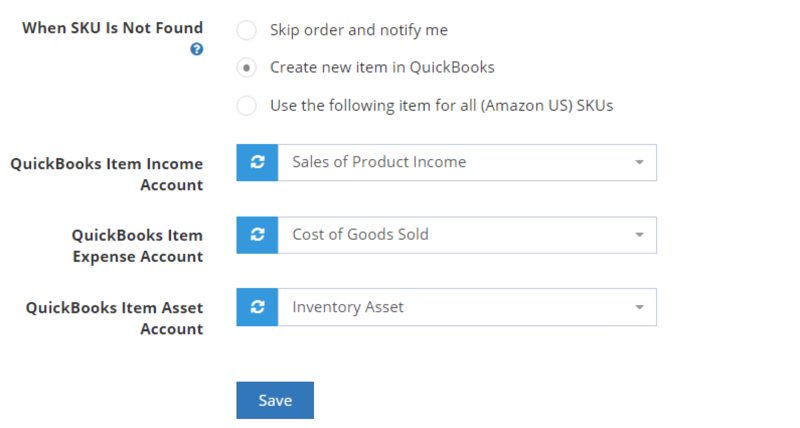 Choose the default Inventory income, expense, and asset account for us to use with the new Inventory items we create. If you don't want us to create the items, then click on "Skip order and notify me." We'll send you an email when we see a transaction that doesn't have a corresponding QuickBooks Online inventory item. If you're using QuickBooks Online Simple Start or Essentials, then you'll have to map your Amazon SKUs to a non-inventory item. If you get an error that the item needs to be purchasable, then look here. If you want to customize mapping of Amazon SKUs to specific QuickBooks Online Item Names, then use the Custom Mapping section below. Copy and paste your Amazon SKU in the Amazon SKU field and then copy and paste your QuickBooks Inventory Name item. Choose Class and Check the Assign to Item Fees and Income if needed. Click on Assign. You'll be able to see your custom mapping below. Verify the mapping and edit or remove as necessary. If you want to add class tracking, see below. If your QuickBooks Item Name and Amazon SKU are the same, leave the QuickBooks Item Name field blank. If the QuickBooks Item is different from the Amazon SKU, then make sure to enter the name you want mapped to that Amazon SKU. Once you've clicked on Assign, you'll see all the saved mappings below. If you're uploading a list of hundreds of custom mappings, we recommend that you allow the Custom Mapping process to complete before you begin data synchronization. Otherwise, there may be errors or incorrect documents created because the item mapping isn't complete. If you have a lot of items to map, then you can use a spreadsheet and export it to a CSV (comma-separated values) file afterward. 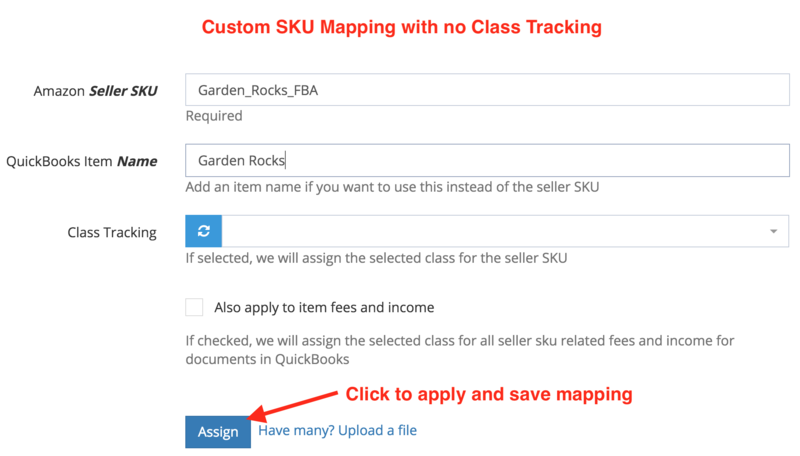 Custom mapping of several SKUs to one QuickBooks Item is useful in cases where you have an open box item or a customer return that is used but in sellable condition. Those Amazon SKUs that are being sold as used can be mapped to the same QuickBooks Inventory Name instead of having to create a new Inventory item. 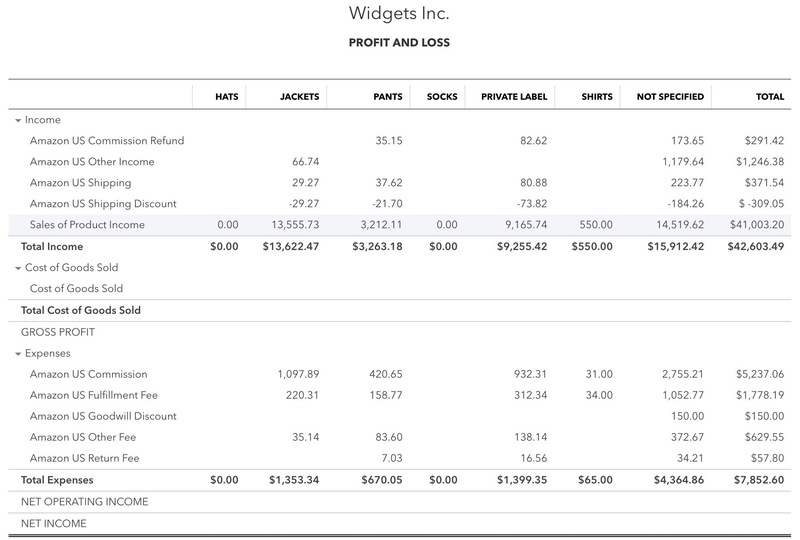 If you're selling the same item under FBA and FBM, you can also map both to the same QuickBooks Item. Class tracking is useful in cases where you want to track groups of items you're selling and/or where you want to track income and expenses for specific products. For instance, you may want to group all hats, socks, and sweaters under their own classes to track sales for each category. Consignment sellers can create a class to track all their income and fees for each consignee to separate income and expenses. We highly recommend that you upload your file and wait for us to complete the process. We'll send you an email when we're done.